The name Deepak Jaikishan suddenly filled almost all newspapers as if he is a Bollywood star who just came up with a controversial film. This name was mentioned a little while back by Raja Petra Kamaruddin, a pro-opposition writer who had a mental issue back when he was young, often admitting that he is tough and a man of principal who then ran away and could not prove his claim on the Prime Minister which he said, was involved in Altantuya's murder. Raja Petra previously claimed that Deepak was the 'middle man' who introduced a private investigator, Balasundram to the Prime Minister. Bala then became a refugee after making a U-turn in his Statutory Declaration which links the Prime Minister with the murder of Altantuya. 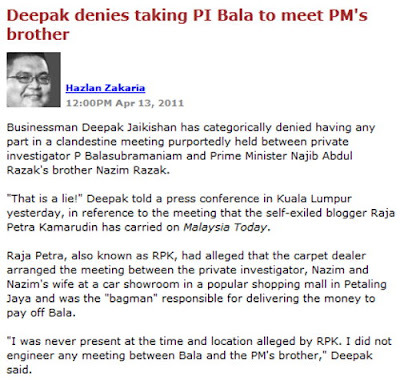 As a response for Raja Petra's article, Deepak then denied all of those claims and made a statement to Malaysiakini. Perhaps we do not have to mention here that Raja Petra also then made a U-turn without admitting guilt, that he made the claim by following 'orders' from certain individual and that everything one of his claims were false and it was simply done to tarnish the image of the Prime Minister. Raja Petra's expose then put a stop to the opposition's strategy in this issue. Despite that, when things get worse for them where all of their attempts to bring down the Prime Minister is not going well with all street demonstrations did not bring any impact and that Anwar did not end up behind bars, so the opposition decided that the issue of Altantuya is the only issue that is big enough for them so that they could get to Putrajaya. Thus, SUARAM is then used to replay this issue internationally, to France. The purchase of submarines by the Defence Ministry is used as a case which is not even a case in the first place. The opposition was hoping that since the issue involves other country, their supporters would not really realize that they are lying, at least until the election comes. Sadly, election did not come as soon as they expected that finally SUARAM's lie was revealed when the French themselves revealed that the French court rejected SUARAM's complaint since earlier this year, because it was baseless. With RPK surrendered, SUARAM then fell to their own trap, the issue of Altantuya was officially cloesed. Pakatan Rakyat is then hit with various internal issue while BN gets stronger as the country's economic record improves. Hence, the opposition began to get desperate and they needed bigger issues to cover all of their weaknesses and to divert rakyat's attention from the government's good records. It is not a coincidence that as UMNO had its General Assembly, SUARAM made a press conference in Singapore regarding the issue of submarines and Altantuya. Then, Deepak's issues began to start from Singapore. The issue of Deepak which is in an ongoing process in the court is based on Deepak's demand on a business project which did not happen which coincidentally, has a handwritten note saying 'no stopping' from the Prime Minister. However, the question is, what is Deepak's rights to claim for money on the excuse that he has a cable which allows him to receive bank loans? How can we prove that there even was the 'cable'? And what makes him have the rights to receive the loan for the project? These questions are answered when opposition media quoted Deepak's case in court which has nothing to do with the case. Instead, the issue of Altantuya and the name of Balasundram became the focus on their reports. During the interview with Harakah, Deepak made a statement which contradicted from his statement to Malaysiakini. The case on his business was explained by Deepak himself through his statement to Malaysiakini in 2011. He said that the RM600 million loan which he received from Kuwait Finance House was for a property investment and that it was guaranteed by his directors and shareholders, as well as the bank itself. He also explained that the contract for the interior design for the new castle at Jalan Duta was received from the main contractor and not from the government. In short, he is a true businessman and he is not involved in politics. Deepak also denied that he knew Balasundram in the Malaysiakini statement. However, he seemed to have made a different statement in Harakahdaily. By bringing a blurry business case and linking it with other issues which have no relations at all, it is clear that Deepak was responsible to pick up the pieces for RPK and SUARAM, for the opposition. For that, Harakahdaily and Malaysiakini probably need to come to an agreement before making any decision, which one of them are lying, or which one of Deepak's statement should be reported as their lie after this. 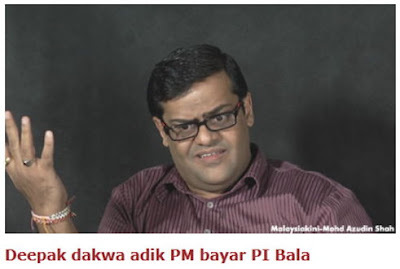 It seems that RPK is not the only one who has been watching a lot of Bollywood films, like what Deepak said in his statement to Malaysiakini. Whoever wrote the script for RPK or Bala, and probably Deepak, clearly cannot create a good story. The murder story which has its links with the purchase of submarines and business became contradictory, inconsistent and it took a few U-turns should be able to attract a lot of viewers, but it would be sickening if it is tried to be conveyed as a true story. Perhaps Pakatan Rakyat as well as its NGOs or individuals which act as their puppet, including their 'sponsors' need to think of other ways to knock BN or the Prime Minister out. Haven't they learn from their mistake that the strategy of writing accusation script to be played by their acts is not a good strategy. It may be able to make their loyal supporters get exited, but as for supporters who are rational, they might remain undecided or probably stay away from the party.